"Our Magic is not omnipotent... a little bit of courage is the real magic." Ten-year-old Negi Springfield has just graduated from a magic academy in Wales, and finds that his assignment for earning his full magic license is a job as a teacher—in a private all-girls school in Japan. Worse than that, though, is that it's a junior high class—most of the girls are four or five years older than him, and almost all of them think he's the cutest thing since Hello Kitty. Created by Ken Akamatsu, this series has been summed up (with hotly-contested accuracy) as "Harry Potter meets Love Hina and Dragon Ball". Rumor has it that when planning out Negima!, Akamatsu wanted to do a Shonen fighting manga. However, his publisher (wanting to cash in on the success of Love Hina, Akamatsu's previous work) insisted on another romantic harem comedy. So, Akamatsu created a fighting story that looked superficially like a harem comedy. The story has since changed into a action comedy/drama with a huge cast (30+ "regulars") and an expanding Backstory. The first anime, Negima! (take note of the punctuation; it becomes important), concluded in late 2005 after only 26 episodes. Understandably, the plot was tremendously telescoped—the anime parallels the volumes one through six of the manga in its first 20 episodes or so, and then hurtles into a sudden and somewhat hasty Grand Finale arc, in the process skipping over a vast landscape of storyline and character development and abandoning several plot threads just set in motion. It would appear that the studio had planned for more than one season to tell the full manga story, and then were disabused of that notion with less than a third of season left to tie things up. The result is a conclusion that, while dramatic and fulfilling the promise of the show's premise, is abrupt and seems to come out of left field with no warning—especially the shocking event that sets the concluding action in motion. The FUNimation adaptation took nearly all of the studio's most frequently-used voice actresses, some of them playing two or three of the girls at a time. 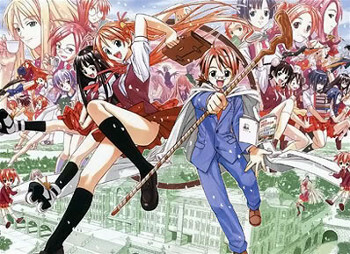 In Autumn of 2006, a new series was released: Negima Second Season It is a Re Boot of the storyline, with a earlier time slot (leaving the Fan Service packed off to the OVAs until later in the story), a more obvious Shounen bent, and a distinct flavor of humor courtesy of Studio Shaft, the production company that made Pani Poni Dash!. A manga adaptation loosely based on this reboot, titled Negima Neo, began running in late 2006, taking plot points from both the original manga and the Negima Second Season anime and running through both in very different ways than its predecessors. And now has its own page Negima Second Season. In October 2007, a Live Action Adaptation called Negima!! was aired. Like Negima!? before it, the plot is a Re Boot of the basic storyline. And like most Live Action Adaptations of anime, it tries to pull off the same kind of manic visual humour (and Fan Service) that its animated counterparts have, which sometimes succeeds but often comes off as awkward. Beginning in 2008, a new animated project was released: a three-episode OVA called Mahou Sensei Negima! : White Wing/Ala Alba, covering the brief breather arc between the Mahora Festival and the trip to the Magic World (chapters 176-183, specifically). These were released alongside limited edition variants of manga volumes 23-25 and, in a refreshing change to the franchise's history of animation, were a faithful adaptation of the chapters it adapted. These were followed up in 2009 by a four-episode (plus one extra) OVA titled Mahou Sensei Negima! : Another World. These were released in limited edition variants of manga volumes 27-28 and 30-32, and cover the beginning of the Magic World arc. The same studio that handled Negima!? is in charge of this adaptation, but this time it feels like the manga—only with added sound, color and movement. Negi and friends appear in the Massive Multiplayer Crossover game released in 2009, Sunday VS Magazine Shuuketsu Choujou Daikessen. It then got another spin-off, titled Negima (Ito) Bun (a.k.a. : Negima Little Girls), which reversed the age gap: Negi as a young man teaching a kindergarten class. An anime movie, entitled Mahou Sensei Negima! Anime Final, was released on August 27, 2011. Details are not yet available, but it is expected to have continued from after the Another World OVAs, and have a different ending than is planned for the manga. In March 2012, the Mahou Sensei Negima! manga ended at 355 installments and 38 published tankoubon volumes. Unfortunately for readers, Akamatsu deliberately ran the storyline right into a wall as a protest against the manga industry trying to seize more rights (and profits) from its artists; the ending is both abrupt and unfulfilling. In 2013, Ken Akamatsu began releasing a sequel series, UQ Holder!. For tropes relating to the characters, head out to the characters' page. Warning: Your computer may implode from data overload. TV Tropes apparently already did. Twice. There's also a Shout-Out page here and an entire page of Ship Teases here. A quick review: Mahou Sensei Negima! is the original manga, Negima! is the first anime, Negima Second Season is the second anime, Negima Neo is a hybrid manga from the original manga and the second anime, and the newest OVAs start with Mahou Sensei Negima! in the title. When you get confused, just come back up here to check. This page was last edited on 21 May 2018, at 17:08.